WERE Angel Rosabal Valdivia not Cuban, he might now be languishing in an immigration cell. In early March the 31-year-old computer technician crossed a bridge over the Rio Grande between Mexico and Texas without a visa and presented himself to border guards. Because Mr Rosabal is Cuban, he was swiftly granted leave to remain. Under a series of laws dating back to the cold war, notably the Cuban Adjustment Act of 1966, most arrivals from his island are welcomed as if they are political refugees, then granted permanent residency after a year and a day. Lexington met Mr Rosabal in Miami on March 7th in the offices of Church World Service (CWS), a refugee-assistance ministry. He was one of a throng of new arrivals being processed into the Cuban-Haitian Entrant Programme, under a 1980 law that makes Cubans instantly eligible for public assistance that most immigrants wait years to receive. Fresh-faced, and proudly sporting a watch that he had refused to give to people-smugglers during a ten-month trek to America via Ecuador, Colombia, Panama and Mexico, Mr Rosabal said the journey cost him $3,000. He was robbed twice—Colombia is “so bad”, he shuddered. Drawing on government grants and private fundraising, CWS (run by a coalition of Protestant and Orthodox churches) was about to put him up in a hotel and help him apply for a work permit. Within a week the ministry would fly him to one of six cities where it works with churches and employers to resettle new arrivals, from Lancaster, Pennsylvania to Louisville, Kentucky. After six months, 90% of CWS’s resettled Cuban clients are self-sufficient. Mr Rosabal was told that within a fortnight he can expect to be working, perhaps in a hotel or egg-packing plant. He looked cheerful but a little dazed, after arriving at dawn on a minibus from Texas. He had been in Florida seven hours. During his trek, other Latin Americans often asked Mr Rosabal why America offers special privileges to Cubans. Mr Rosabal would reply that back home with two jobs—working with computers by day and as a security guard by night—he earned $62 a month. Venezuelan or Colombian companions would gasp, asking: “How can you survive?” But Mr Rosabal misjudges his new American homeland. The special status of Cubans owes more to politics than to pity, and the politics is changing fast. Cuban-Americans have long enjoyed outsize clout, thanks in part to their concentration in Florida, a presidential battleground state. But the Cuban-American vote is evolving. Once, conservative exiles could halt Miami traffic with vast anti-Castro protests. Now their grandchildren are more likely to support lifting the embargo imposed on the island 55 years ago. When Republicans hold a presidential primary in Florida on March 15th, two of the four candidates will be Cuban-American senators, an astonishing feat for a community of about 2m people, or 0.6% of the national population. Both are supporters of the embargo. One of them, Senator Marco Rubio of Florida, introduced a bill in January that would end welfare payments and public assistance for Cuban arrivals unless they can prove that they faced political persecution back home—though he stopped short of suggesting changes to the entry privileges in the Cuban Adjustment Act. Campaigning in snowy New Hampshire, Mr Rubio cited reports of “outrageous abuse”, such as Cubans who claim American pensions while living on the island. His bill matches one introduced in the House of Representatives by Carlos Curbelo, a Miami-area Republican, who scolds what he calls “non-refugee Cubans” for abusing American goodwill. The longest-serving Cuban-American in Congress, Representative Ileana Ros-Lehtinen of Miami, said late last year that “it wouldn’t break my heart” if the Cuban Adjustment Act itself were repealed. Cubans sense the changes. Arrivals from the island have surged since December 2014, when President Barack Obama announced his plans to restore many diplomatic and economic ties. More than 43,000 Cubans applied for entry to America in 2015, a 78% increase on the previous year, some after perilous sea-crossings. Republicans blame Mr Obama. Ahead of his visit to Cuba on March 21st and 22nd, the first by a sitting president since 1928, Cuban-American members of Congress accused him of triggering “desperation” among Cubans with his policy of “unconditional engagement with the Castro dictatorship”. Democrats blame Republicans for stoking fears on the island that the Cuba Adjustment Act will be scrapped. Annette Taddeo, a (Colombian-American) Democrat running for Mr Curbelo’s House district, accuses her Republican opponent of playing on resentments within their heavily Hispanic corner of south Florida. “The electoral calculation is to divide Cubans from non-Cubans, and older exiles from newer arrivals,” she charges. Ms Taddeo would preserve Cuban entry privileges until a broader immigration reform is achieved: a tough call in a year when voters are tingling at talk of border walls. At root, today’s fights about Cuban migration turn on old arguments about whether the island is best liberated by openness or isolation. Bruno Barreiro is the Miami-Dade county commissioner for Little Havana, a bastion of anti-Castro fervour. He says the Cuban Adjustment Act was a mistake: if Cubans had been bottled up on the island, they would have exploded long ago. The act saved lots of lives, Mr Barreiro concedes: “Unfortunately, it also permitted the Castro regime to stay in place.” Not every anti-Castro politician goes that far, though the logic of isolation underpins politicians’ growling about Cuban-Americans showing disloyalty by returning to the island to visit their families. In the end, the only sustainable Cuban immigration policy involves a free and prosperous island, 90 miles off Florida. 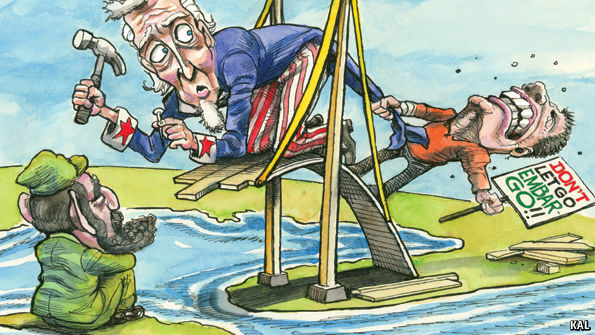 Cubans’ entry privileges may be a relic of the cold war. But so is the failed embargo. Scrap both at the same time, and bet on openness.